No-needle mesotherapy, such as offered with the Eporex and Acthyderm devices, seeks to achieve the same aim as injection mesotherapy and thus is targeted at the same treatment indications, such as skin rehydration and toning as well as cellulite and fat reduction treatments. It uses a pulsed low frequency electric current to deliver active ingredients into the skin. Treatments are said to feel like a ‘pins and needles’ sensation, but are generally described as not uncomfortable. Results do vary between individuals and the devices used. Unfortunately very little clinical data exists for such no-needle mesotherapy devices and certainly no independent, peer reviewed studies are currently available. Private costs for no-needle mesotherapy depend on the size of the area(s) being treated and the indication for treatment. For example, private costs for a programme of Eporex™ sessions will cost between £350 - £800, with an average of approximately £700. Acthyderm® claims to be the first device to use the concept of skin electroporation in order to perform no-needle mesotherapy. Eporex™ no-needle mesotherapy seeks to achieve the same as injection mesotherapy, by encouraging the penetration of topically applied active ingredients through the skin using mild electric currents. Mesotherapy is a medical technique first devised in the 1950s by a Frenchman called Dr Michel Pistor. It involves the micro-injection of a specially prepared mixture of vitamins, amino acids, and medications, placed into the mesoderm (i.e. just millimetres under the skin) within a problematic area. It was initially used to treat such conditions as rheumatism, sports injuries, and for the improvement of blood circulation, and has now been used successfully by some practitioners for the treatment of cosmetic conditions, including skin rejuvenation, hair re-growth, localised fat reduction, and as a treatment for cellulite. It still maintains its roots in France where it is commonly practiced by more than 15,000 practitioners and is taught in French medical schools. Mesotherapy is now also gaining widespread acceptance by cosmetic clinics in the UK and the USA. Many people are not comfortable with the concept of multiple injections, so aesthetic device manufacturers have sought ways to offer no-needle alternatives. If you are considering treatment with no-needle mesotherapy, the following information will give you a basic understanding of the procedure. It can't answer all your questions, since a lot depends on the individual patient. Please ask a practitioner about anything you don't understand. What is No-Needle Mesotherapy and how does it work? The idea behind mesotherapy is that you can get the active substances or ingredients, in small quantities, to the site requiring treatment by directly injecting them there. This is instead of relying on a tablet or intravenous injection where higher concentrations of a drug or other ingredient are required to be given in order to get adequate levels to the site requiring treatment. The actual preparation injected during mesotherapy depends upon the problem being treated. In general, the substances used can include: local anaesthetic, and products that may reduce inflammation, muscle relaxants, enzymes, vitamins, minerals, plant extracts, growth factors, hormones, and hormone blockers; to name but a few. Treatment is administered by multiple micro-injections using a very fine needle, which are either delivered individually by the practitioner’s hand or using a ‘meso-gun’ which fires the tiny needle into the skin and delivers a specified dose with more repetitions than can be achieved manually, hence making for a faster and some would argue more consistent treatment. When used in the treatment of ageing skin mesotherapy aims to replace minerals, vitamins and amino acids that are found in lower levels in skin as we age. It is also used to boost levels of hyaluronic acid, another important component of the skin that helps to maintain firmness and texture, levels of which decrease as skin ages. It is claimed that injecting more hyaluronic acid just below the surface of the skin helps to stimulate more collagen production, which, in turn, improves skin tone and helps to reduce fine lines and wrinkles. No-needle options seek to achieve the same aim as injection mesotherapy, but look at ways to encourage the penetration of active ingredients, when applied topically to the skin, through the protective barrier layers of the skin’s surface using mild electrical currents to assist the transportation of the substance between the skin cells. This pain-free option is therefore said to provide a viable mesotherapy alternative for needle phobics. The technique of electrical transdermal delivery, whereby the substance being used to treat the area is ionised (i.e., the molecules within it are given a positive or negative charge) using a galvanic current, has been developed since the first discovery in the 1700s. This method uses the natural repulsion and attraction properties generated by positive and negatively charged agents when an electrical current is applied to the substance in contact with the skin, to literally repel the ingredients into the depths of skin. Early techniques not only suffered from poor skin penetration abilities (often much less than ½cm), despite their ability to carry high concentrations of active ingredients, but also required polarised substances (i.e. ones with already charged molecules). The use of a continuous current also increased the likely risk of surface skin burns. This first known technique was called ionophoresis, where ‘phoresis’ originates from the Greek meaning ‘being carried’, and ‘ion’ refers to a positive or negatively charged molecule, so literally ‘ionophoresis’ is a technique for carrying these molecules. The technique to show promise was iontophoresis, which has now been used by medics as a non-invasive drug delivery method for medication since the 1960s. It no longer used a continuous wave of galvanic current but modulated it into impulses. This lowered the incidence of burns whilst disappointingly also lowering the amount of active ingredients which could be carried, but as the wave frequency was not altered the levels of skin penetration remained very much the same as with ionophoresis. One device, Eporex™ uses a similar process of electrical transdermal delivery called isophoresis, which it claims overcomes some of the disadvantages of earlier techniques, such as poor skin penetration and the need for polarised products. It uses a pulsed low frequency current, whose intensity is adjusted by the operator, and delivers a particular waveform which ionises the molecules in the active ingredients used in the treatments, and creates small channels in the skin for the ingredients to travel down. The head of the device is similarly charged to the ionised molecules and as it moves across the skin it repels the molecules deep into it. Ingredients contained in water soluble molecules permeate the skin’s natural lipid barrier and then cascade through the tissue beneath via minute channels created between the cells known as aquaporines, created by the Eporex™ waveform current. It claims to be able to penetrate the skin up to 9 -10cms and be able to introduce 90% of the active ingredients being administered. The treatments use a variety of substances derived from herb and vegetable extracts, as well as human growth hormones. Many of the ingredients exist naturally in the human body so the treatment is designed to provide a top-up to increase the body’s ability to burn fat or regenerate tissue. What can No-Needle Mesotherapy treat? No-needle mesotherapy seeks to achieve the same aim as injection mesotherapy and thus is targeted at the same treatment indications, such as skin rehydration and toning as well as cellulite and fat reduction treatments. The manufacturers of the Eporex™ no-needle mesotherapy device say that is able to offer twelve different treatments for the face and body using a variety of adjunctive ingredients and serums, including targeted fat, cellulite and stretch mark reduction, breast firming, treatment for stress related hair loss (alopecia), skin toning and tired eye treatment for dark circles, plus facials for preventative anti-ageing (under 30s), rejuvenating with hyaluronic acid (over 30s), acne stop for mild to moderate acne and mesolift for facial expression lines. What happens during a No-Needle Mesotherapy treatment? Careful discussions regarding your reasons for wanting no-needle mesotherapy treatment are very important before you begin the treatment. You must also make sure that this treatment can deliver what you want and how you would like to look afterwards. It is also worth researching whether this is the right sort of treatment for you and how successful it has been on other patients. Your practitioner should be able to answer all these questions. This will differ depending on the type of machine used. For Eporex™ treatment sessions are carried out once a week, and are likely to last about half an hour each. You should usually see changes within a couple of sessions, but 7 is the average number of suggested treatments. Monthly maintenance sessions are then suggested afterwards to maintain the results. For fat reduction, often an eating plan, designed to reduce carbohydrates and advice on exercise will also be provided for in between sessions. How long will it take to recover from No-Needle Mesotherapy? What are the risks and potential complications from No-Needle Mesotherapy treatment? Treatments are said to feel like a ‘pins and needles’ sensation, but are generally described as not uncomfortable. There are said to be virtually no risks or side effects for healthy candidates. However, there is the possibility of allergic reaction to one or more of the ingredients within the topically applied serums used which would become apparent immediately on application by the appearance of redness. Any likely candidate with a history of allergies is therefore advised to take a patch test before treatment. Who should not have No-Needle Mesotherapy treatment? Although, due to the electrical output of the devices used, treatment is not suitable for pregnant women or those people with epilepsy, pacemakers or any serious psychological or medical condition. Who can perform No-Needle Mesotherapy? Suitably trained non-medical therapists can perform no-needle mesotherapy treatments such as Eporex™ and Acthyderm®. What is the average cost of No-Needle Mesotherapy? Private costs for no-needle mesotherapy depend on the size of the area(s) being treated and the indication for treatment. For example, private costs for a programme of Eporex™ sessions will cost between £350 - £800, with an average of approximately £700. No-needle mesotherapy, such as offered with the Eporex and Acthyderm devices, seeks to achieve the same aim as injection mesotherapy and thus is targeted at the same treatment indications, such as skin rehydration and toning as well as cellulite and fat reduction treatments. It uses a pulsed low frequency electric current to deliver active ingredients into the skin. The medical jury is still very much out on whether or not needle mesotherapy produces any long term, lasting results for the variety of areas that it claims to treat. Many practitioners believe that the effects are from the needling itself and not the introduction of any substances. If this is the case then for no-needle alternatives such as Eporex it is going to be even harder to prove that the active ingredients get to where they are required and actually do something once they are there. One could argue that in the case of treatments targeted at fat reduction, the advice to eat fewer carbohydrates and to exercise could in themselves produce the inch and weight loss claimed by Eporex. Unfortunately very little clinical data exists for such no-needle mesotherapy devices and certainly no independent, peer reviewed studies are currently available. 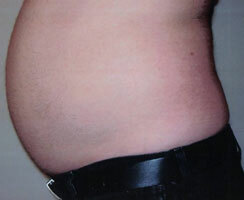 One retrospective review of 38 patients, (30 female and 8 male), from an Eporex centre in Edinburgh who completed a course of seven treatments for targeted fat reduction on the abdomen and were also given eating plans to reduce carbohydrates and advised to exercise, showed an average female weight loss of 6.5lbs, and an average centimetre loss of 4.7cm on the upper abdomen, 6.12cm on the lower and 7.23cm on the midriff. Results for male patients were comparable. Results do vary between individuals and the devices used. As with many new technologies, manufacturer claims tend to be somewhat embellished, and we must offer a note of caution on their efficacy, as until long-term clinical evidence is gathered, little is known of any proven scientific merit and potential future complications. Female abdomen before and after 7 sessions of Eporex™ no-needle mesotherapy for targeted fat reduction. 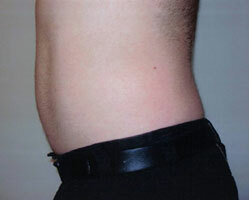 Male abdomen before and after 6 sessions of Eporex™ no-needle mesotherapy for targeted fat reduction. Click for ALL No-Needle Mesotherapy clinics in the UK & Ireland registered and verified by Consulting Room.